From the rainbow-striped petrified wood of Escalante to the monolithic stone spires of Kodachrome Basin, Utah plays host to some of the most magical state parks in the country. Whether you’re looking to go for a hike, go birdwatching or camp out, these Utah state parks will not disappoint. Here are our favorites. Goblin Valley State Park looks like something you would find on the planet Mars. The result of millions of years of strange sandstone weathering, the so-called “hoodoos” or “goblins” that make up this surreal, red-rock valley are as cute as button mushrooms. In Goblin Valley State Park, you can explore, hike, take in the park’s one-of-a-kind views, or even play a friendly game of disc-golf. Utahans travel far and wide to visit Bear Lake State Park in Northern Utah, and after a few hours on Bear Lake’s shores, you’ll understand why. Probably the closest thing Utah has to a proper beach, Bear Lake State Park is a great place to cool off in the summer with jet skis and a thick, fresh raspberry milkshake. If you are less interested in Utah’s nature and more interested in its history, This is the Place Heritage Monument State Park is a great option for an entertaining day trip. Located a few minutes from downtown Salt Lake City, the park is a collection of more than 50 historic buildings from Salt Lake’s first Mormon pioneer settlements. Actors, historians, and activities bring the village to life. Utah’s newest state park, Sand Hollow is popular with water-lovers, who thrive boating, fishing, and diving in the crystal clear, blue waters of Sand Hollow Reservoir. Less crowded than Bear Lake State Park, Sand Hollow is arguably both more scenic and more unique. A hiker’s paradise, Snow Canyon State Park is filled with exciting trails and towering dunes. Covering 7,400 acres, the state park is famous for its beautiful Navajo sandstone canyons. If you’re a sucker for sunsets, you’ll love the way light and shadow add to the vibrancy of Snow Canyon’s geologic formations. Dead Horse Point State Park is famous for its views and extreme conditions. Opened to the public as a state park in 1959, Dead Horse Point is still one of Southern Utah’s best kept secrets. You’ll be impressed by the amazing landscapes this spot (which is technically a peninsula of rock perched atop sandstone cliffs) brings to life. Not far from Canyonlands National Park, Dead Horse Point is the perfect, quick stop over. Kodachrome Basin State Park is another out-of-this-world, desert destination. Rather than “goblins,” this park is home to 67 monolithic stone spires made up of kaleidoscopic layers of sandstone. This state park is popular for its hiking and biking trails, as well as for its camping facilities and brand new laundromat. Spanning 42 square miles, this park is a one-of-a-kind island situated on an extremely salty body of water. And while the Great Salt Lake may not sound like the island vacay of your dreams, it is spectacular in its own right. Antelope Island, in particular, is popular with campers, hikers and bikers, as well as with free-ranging bison, mule deer, antelope, and bighorn sheep, all of which call the island home. If you thought This is the Place State Park was the extent of Utah’s history, think again. Native American tribes have called Utah home for centuries. And the Anasazi Museum State Park is a great place to learn more about one of the tribes that called Utah home centuries ago. 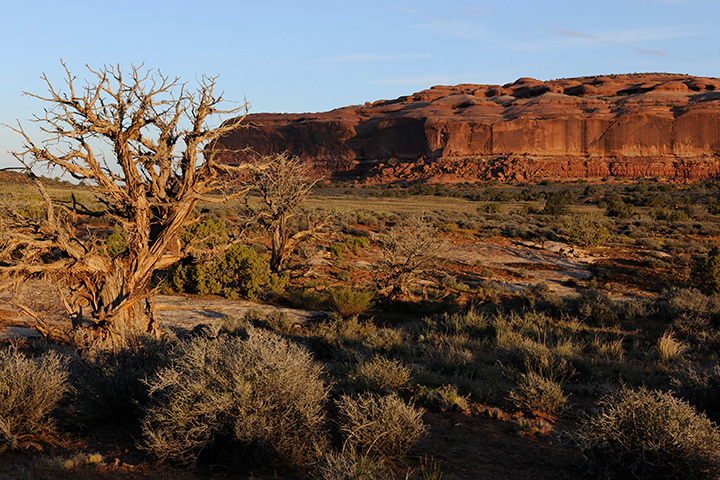 At the park, you can explore an impressive Anasazi village that was likely occupied from 1050 to 1200 A.D.
A visit to Southern Utah is a reminder of the world’s distant past, when dinosaurs roamed and a massive lake covered most of the state of Utah. Escalante Petrified Forest State Park is an especially stark reminder of this past. Perfect territory for casual exploration, the park is home to an astounding amount of rainbow-striped petrified wood, from which it gets its enchanting name.